There is something about corduroy that makes everything feel just a little cozier and always feels nostalgic to me. I used to wear a lot of it when I was young and honestly haven't worn it in years. I saw this skirt about two weeks ago and immediately loved it. I didn't end up buying it that day but couldn't stop thinking about it so I went back last weekend and snagged it! Lucky for me, they only had 3 left in store, all in my size, totally meant to be. This day was an expectionally perfect fall day in New England with blue skies, crisp air, and the foliage showing off. I don't if I just forever year after year, but the foliage this year is absolutely stunning and I cannot get enough of the bright colors. 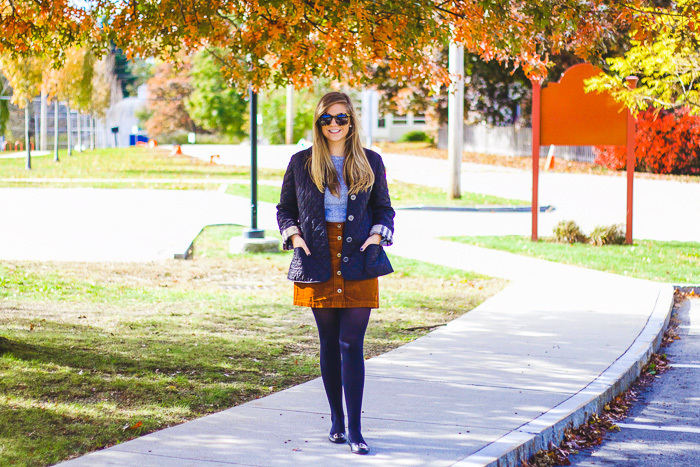 The deep rust color of this skirt matched perfectly with the changing leaves, which made me even happier. This day, I choose to pair my skirt with tights, flats, and a simple grey sweater (which is super soft!) but I also plan to wear it with a chunk turtleneck sweater and knee high boots for a totally different feel.